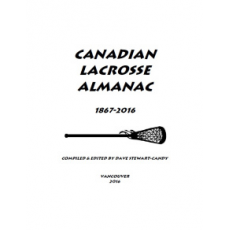 The almanac’s initial focus was primarily on the statistical history of British Columbia lacrosse leagues – namely, annual league standings along with post-season play. It was the first publication to research and examine the pre-1932 era in British Columbia which until that time had never been documented at a statistical level. Over time, further research uncovered new data and new material was made available to the author. Cost and production issues made the author switch from a print format to releasing it in a PDF format – made available for free – when he completed a second edition in 2005. With the current 2017 edition now at 592 pages (with 26 more pages of new content compared to the 2016 edition), the almanac has expanded to cover the rest of Canada as well as American NCAA collegiate, professional leagues, international competitions, and foreign domestic leagues where information is available.